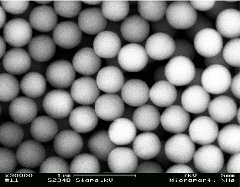 Silica particles in the nanometer as well as micrometer diameter range find an increasing use in medical diagnostics, in the pharmaceutical industry, in biotechnology and molecular biology, sensor technique, materials sciences, colloid research, and others. Sol-gel processes that were established already at the end of the 1960s by Stöber and coworkers allow for the rather convenient preparation of monodisperse silica particles in the size range from 100 nm to 3µm. So far, attempts that were made to utilize these processes for the manufacture of silica microspheres in the micrometer diameter range above 3 µm failed. This was mainly due to the barely controllable balance between nucleation and growth on one hand and reduced colloidal stability on the other. As a consequence, often dumbbells, irregularly-shaped particles, and heavily broadened particle size distribution are yielded. 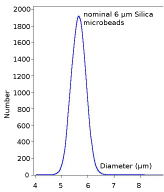 In the market, monodisperse silica particles in the micrometer diameter range above 3 µm are either rarely found or the offered materials show broad size distribution with CV values of about 20-30 %. 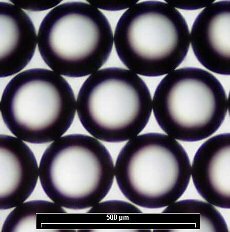 Recently, we have successfully developed a modified sol-gel strategy for the preparation of monodisperse silica microspheres in the diameter range up to 8 µm. By further developments of this process, a considerably extended range of high-quality silica particles above 8 µm up to 25 µm could be achieved. Narrow particle size distributions (CV < 5 %). High mechanical and thermal stability. The Silica-microspheres come as 5 wt.-% aqueous dispersions or in dry powder form. They can be used in a number of applications, such as isolation of nucleic acids, purification of biomolecules, preparation of hollow capsules, or in particle-based immunoassays. For the simultaneous detection of different analytes, multiplex analyses with flow cytometers have proven a very efficient method in quite a number of sample types. The process relies on highly monodisperse polymer particles with distinctively graded fluorescence intensities as well as particle diameters. In order to achieve a high sample throughput, the automatization of the technology is desireable. To date, this challenge is not solved in a satisfactory manner by any of the competitors in the market. A smart way toward the automation of particle-based methods is the usage of paramagnetic beads that can be moved and directed by external magnetic fields and thus are suited for computer-aided process sequences. 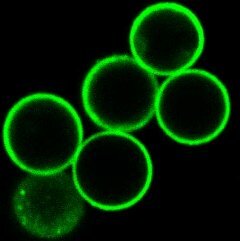 microParticles GmbH’s scientists now succeeded in the manufacture of 7 µm diameter superparamagnetic polymer particles with up to 12 fluorescent intensities that are distinct from each other. 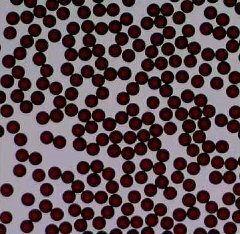 In combination with analogous 5 µm diameter beads, a whole range of up to 20 distinguishable superparamagnetic fluorescent particles was set up. For the coupling of antibodies to the particles they have been equipped with carboxyl functions (PS-MAG-Fluo-COOH, see figure). Our investigations also yielded a good batch-to-batch reproducibility both with respect to particle diameters and fluorescence intensities. In the course of our research on paramagnetic polymer particles with fluorescent labels, we recently did succeed in the manufacture of superparamagnetic particles carrying two different coexisting fluorophores. Due to an appropriate design, both emissions can be distinctively observed in one and the same particle. The described particles are of spherical shape and possess a narrow size distribution. Moreover, they show strong superparamagnetism and high fluorescence intensities. Currently, the new superparamagnetic polymer particles can be delivered in the nominal diameter range from 1 through 10 microns. Variations of the applied dye and surface functionalities of the particles are possible within a wide range. Optical fluorescence miroscopy of PS-MAG-Fluorescence-S2392 with green and red fluororescent label, resp. Intensive R&D at microParticles GmbH now led to the manufacture of monodisperse superparamagnetic polymer particles which are labeled with a number of fluorophores. 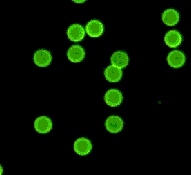 Currently, particle batch PS-MAG-Fluorescence-S2392 (diameter 11.21 ± 0,41 µm, CV: 3,7 %) can be offered. Other diameters are under preparation. The particles are of spherical shape. They have a narrow size distribution, strong paramagnetism, and high fluorescence intensities. 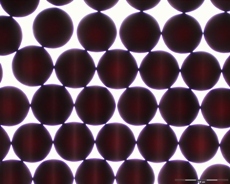 From now on, these beads can be delivered in aqueous suspensions. 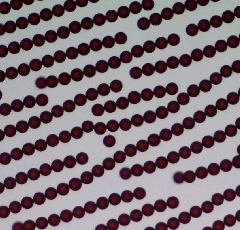 With our technology to manufacture iron oxide-laden polymer particles, we recently succeeded in entering the diameter range beyond 200 µm with superparamagnetic beads. Currently, one batch of superparamagnetic polymer particles is available: MP-MAG-S2211 (375 µm, C.V. 2,0 %). The polymer beads possess strong superparamagnetic properties. They show a narrow size distribution and are of spherical shape. With immediate effect, these new polymer particles are available as aqueous suspensions or in dry powder form. Particle size distribution of PS-MAG-S1702 (400 nm, CV ≤5 %) as determined by Differential Sedimentation (CPS disc centrifuge). Within a BMWi-sponsored R&D project, microParticles GmbH now succeeded in developing monodisperse superparamagnetic polystyrene particles (PS-MAG) with 400 and 600 nm in diameter. The particles are of spherical shape and have C.V. values ≤5 %. Thus, they distinctively differ from competing products currently available in the market. Due to their high iron oxide contents of approx. 50 wt.-%, the particles show an excellent superparamagnetic behavior. Our magnetic beads are available as plain, non-functionalized species as well as with COOH-modified surfaces. The COOH-surface functionalities are suitable for the coupling of proteins or other NH2-containing molecules. 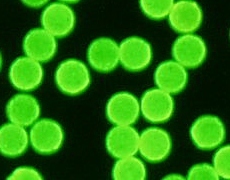 Hence, also streptavidin-modified particles (PS-MAG-SA) do belong to our product portfolio. The binding capacity with this type of beads is in the range of 3000 – 4000 pmol FITC-biotin per mg. In the near future microParticles GmbH will be able to offer its customers also monodisperse nominal 200 nm and 300 nm superparamagnetic PS particles. Magnetic microspheres have found widespread applications in biochemistry, biology, biotech-nology, and medicine. Although a number of magnetic microbeads are commercially available, only few products fulfill the requirements of high magnetizability, narrow size distribution, colloidal stability, minimized nonspecific adsorption, and high bindig capacity for bioligands. High magnetizability due to iron oxide loadings up to 50 wt.-%. 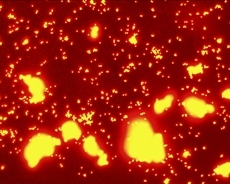 Homogeneously dispersed iron oxide nanoparticles throughout the silica matrix. Rapid attraction of the suspended particles by a conventional permanent magnet. They can be used in a variety of applications like nucleic acid isolation, biomolecule purification, and particle-based immunoassays. As from now, these superparamagnetic silica particles are available with carboxylic groups (5 wt.-% aq. suspensions) or streptavidin-modified surfaces (1 wt.-% aq. suspensions). Currently, research is underway at microParticles GmbH to develop monodisperse magnetic silica miroparticles in the submicron-size range from 200 through 1000 nm, too. Available diameter range nominal 300 nm up to 10 microns. Narrow particle size distributions (C.V. values < 3 %). Untagged or fluorescently labelled, according to customer requirements. Material density 1.05 g/cm³ (PS), 1,19 g/cm³ (PMMA). Nanoscale iron oxide particles are uniformly dispersed throughout the polystyrene matrix. The iron oxide content can be adjusted in a wide range up to 70 wt.-%. These particles are excellent tools for separation and purification of DNA, proteins, or other biotinylated biomolecules, and in several immunoassays. Rapid, efficient, and gentle separation from the surrounding media is possible via an external magnetic field which can be applied just by a permanent magnet. Don’t hesitate to discuss your questions and problems on particle-related issues with us – We would be pleased suggesting solutions for you. Polymer matrix polystyrene (density: 1.05 g/cc; refractive index: 1.59). Extremely narrow size distribution (C.V.
High colloidal stability in aqueous dispersions. The newly available 15 size standards within the diameter range from 100 nm through 1000 nm have been characterized by a high resolution CPS disc centrifuge (DC-24000), photon correlation spectroscopy (PCS), and scanning electron microscopy (SEM). All particle size standards come as 2 % aqueous suspensions in 10 or 15 ml dropper-tipped bottles together with a Certificate of Analysis containing also selected physical data and a graph of the size distribution, and an appropriate Material Safety Data Sheet. Of course our mirometer sized standards remain available to our customers as before. Narrow particle size distributions (C.V. values ca. 5 %). Absolutely spherical shape (no formation of dumbbells or irregular particles). The Silica-particles come as 5 wt.-% aqueous dispersions or in dry powder form. They can be used in a variety of applications like nucleic acid isolation, biomolecule purification, and particle-based immunoassays. Intensive resarch activities of microParticles GmbH led to new monodisperse melamine resin particles functionalized with streptavidin. The introduced particles are meant to be used in streptavidin-biotin technology (see Fig. 1). Main features of our monodisperse melamine resin particles are high sphericity and colloidal stability in an wide pH range. Additionally, the particles possess a hydrophilic surface and high mechanical stability. The covalent binding of streptavidin to the particles is accomplished via COOH groups, located on the particle surface (carbodiimide procedure). 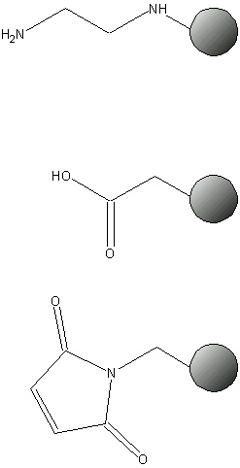 The sucessful streptavidin functionalization of the particle surfaces was shown by labelling with FITC-biotin (see Fig. 2). Currently, we offer nominal 1 µm and 5 µm streptavidin-coated melamine resin particles. Other particle diameters within the range of 0.5-10 µm can be prepared upon request. Furthermore, we investigate streptavidin labelling of other polymer beads, such as polystyrene (PS), polymethylmethacrylate (PMMA), or silica particles. These products will be available soon. they possess a reduced non-specific protein binding activity. 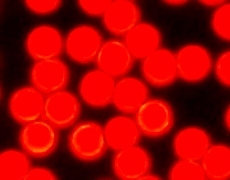 The new PMMA nanoparticles have been characterized with Dynamic Light Scattering Technique (Coulter®-Nanosizer) and Differential Sedimentation (CPS Disc Centrifuge). The particles come as 10 % aqueous dispersions. They can be modified with a number of functional groups, such as carboxy-, amino-, or epoxy-functions, dyes, or fluorochromes. microParticles GmbH has been sucessfully marketing acid-dissolvable melamine resin particles. As a result of recent efforts, the accessible size range could be significantly extended. 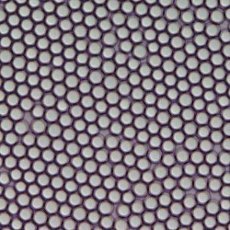 Currently, monodisperse soluble melamine resin beads are available from nominal 500 nm up to 7 µm in diameter. Contrary to our stock-held highly crosslinked melamine resin research grade beads, these specialty particles are weakly crosslinked and soluble in hydrochloric acid as well as in some organic solvents. They are characterized by excellent monodispersity and highly uniform spherical shape. 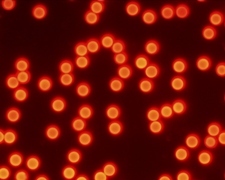 The particles possess a pH-dependent surface charge and are the most suitable choice for polyelectrolyte coatings or as templates for the preparation of hollow capsules. Melamine resin particles with carboxyl groups (group density controllable in a wide range up to 1000 µmole/g). Melamine resin particles with sulfonic acid groups, epoxy- and aldehyde functions as well as thiol und hydroxyl groups on the particle surface. Monodisperse melamine resin particles with maleimide-functionalization for the directed immobilization of thiol-containing compounds (e.g. HS-DNA). Melamine resine particles with covalently fixed polymer coatings like amino dextrane, poly(ethylene imine), poly(vinyl alcohol), etc. These new MF particles not only combine excellent monodispersity and high mechanical and chemical stability, but also low unspecific protein adsorption, variable surface chemistry as well as high colloidal stability in a wide range of pH and electrolyte concentrations. The new products are designed for applications in medical diagnostics and in pharmaceutical and biotech industry. They can be delivered in the diameter range from 300 nm up to 12 µm. High thermal, chemical and mechanical stability. Absolutely stable in all solvents, no swelling or shrinking upon contact with organic media. Upon request, the new particles can be carboxyl-modified and are suitable that way for covalent coupling of proteins and other ligands. Particle diameters above 1 micron up to 5 microns. Narrow size distribution (CV 6 – 7 %). Surface functionalities (carboxyl, amino groups) available on request. In April 2003 microParticles GmbH has been certified under the globally approved ISO 9001:2000 Quality System. Certification validates that microParticles GmbH has implemented and maintains a quality management system (QMS) and establishes microParticles GmbH as a world-class company that continues to be customer and quality focused. For us, being a technology-oriented R&D laboratory, customer satisfaction, management responsibility, and organizational performance are major goals of our company’s philosophy. The ISO 9001:2000 standard delivers excellent means to evaluate and measure those quality metrics. Our competent partner during the process of establishing QMS was EuroNorm GmbH (www.euronorm.de). 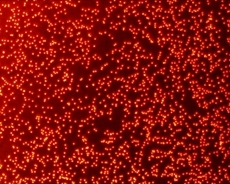 (blue: PS 4 µm, red: PS/PMMA 5.5 µm; diameter of the bubbles approx. 300 µm). Size range from 500 nm to 1000 ТЕm. Dark blue, dark red and black colors available. Narrow size distribution (CV < 3 %). Excellent chemical resistance and thermal stability. 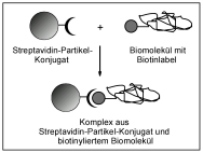 Covalent coupling of biologands, e.g. streptavidin, possible. Can be handled in dry powder form. a new product line of microParticles GmbH, are especially designed for applications in Life Sciences. Using proprietary Layer-by-Layer technology monodisperse particles of different core materials, e.g. polystyrene, melamine resin, or silica in the size range between 300 nm and 50µm, are coated by layers of alternately charged polyelectrolytes. For example, various combinations of fluorescent colour labels can be deposited on particle surfaces. Due to the LbL technology the dyes are located in spatially separated layers which avoids undesired interactions between them. 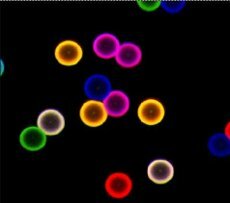 Using 4 dyes with selected fluorescence wavelengths, a library of 15 differently tagged particles is available. The particles can be delivered as aqueous suspensions in 2 or 10 ml packages. 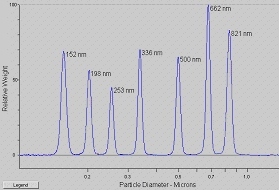 The concentration varies in dependence on the particle size from 5 x 108 particles/ml for 0.5 -2 µm, 2 x 107 particles/ml for 2-10 µm to 5 x 105 particles/ml for 10 – 50 µm. our broad label program offers the opportunity to use the capsules in combinatorial libraries, as sensors in different environments, or as photochemically reactive species. Most accurate size standards available, traceable to primary reference materials from the National Institute of Standards and Technology (NIST) and the Community Bureau of Reference (BCR). CV (Coefficient of Variation) <1,5 %. Absolutely spherical shape and smooth particle surface. Particle sizes and size distributions are determined by Optical Microscopy and Electrical Sensing Zone method (COULTER® Multisizer III). Particle size standards are supplied as aqueous suspensions at 2 wt.-% solids in dropper tipped bottles. The rather high solids concentration facilitates dilution of the standards for use in calibration of many different particle analyzers. Diameters larger than 160 microns are packaged as dry powders in screw-capped bottles. All particles come with Certificate of Analysis and MSDS.